CHECK US OUT ON THE WEB: www.lidomotors.com STANDARD FEATURES: 3rd Row Shoulder Room: 62.4, 4 Door, AM/FM stereo, Body-colored bumpers, Cargo area light, Cassette player, Chrome grille, Clock: In-radio display, Cloth seat upholstery, Coil front spring, Cornering Lights, Cruise control, Cruise controls on steering wheel, Cupholders: Front and rear, Door pockets: Driver and passenger, Fixed antenna, Floor mats: Carpet front and rear, Front captain chairs, Full Third Row Seat, Independent front suspension classification, Instrumentation: Low fuel level, Leaf rear spring, Left rear Passenger door type: Sliding, Manual front air conditioning, Max cargo capacity: 136, Non-independent rear suspension, Other rear suspension, Passenger Airbag, Power door locks, Power remote driver mirror adjustment, Power remote passenger mirror adjustment, Power steering , Power windows, Privacy glass: Light, Rear door type: Liftgate, Rear Head Room: 39.9, Rear Hip Room: 64.9, Rear Leg Room: 36.4, Rear Shoulder Room: 64.6, Regular front stabilizer bar, Right rear passenger door type: Sliding, Roof rack, Seatback storage: 1, Spare Tire Mount Location: Underbody, Steel spare wheel rim. 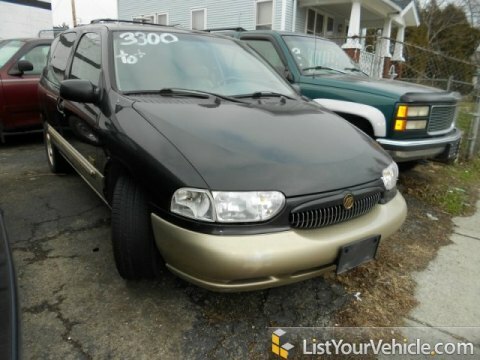 SELLER'S NOTES: Flexibility is the mantra of the minivan customer and our Mercury is humming the same chant. Between the number of doors it offers and the number of seating positions, we're confident that this Villager won't leave you wanting for usability. The second and third rows of seats are the Villager's prime asset. The second-row bucket seats tip forward for easy access to the third bench. They can also be removed for a large cargo area. This baby seats up to seven! Our 1999 Villager boasts AM/Fm steroe, cassette, cloth upholstery, seating for up to seven people and more. Wow! Print this out and come us today for a personalized test drive towards ownership! Price INCLUDES tax and fees but DOES NOT INCLUDE temporary tags. All prices are subject to change without notice. All vehicles are subject to prior sale. Dealer is not responsible for typographical errors.